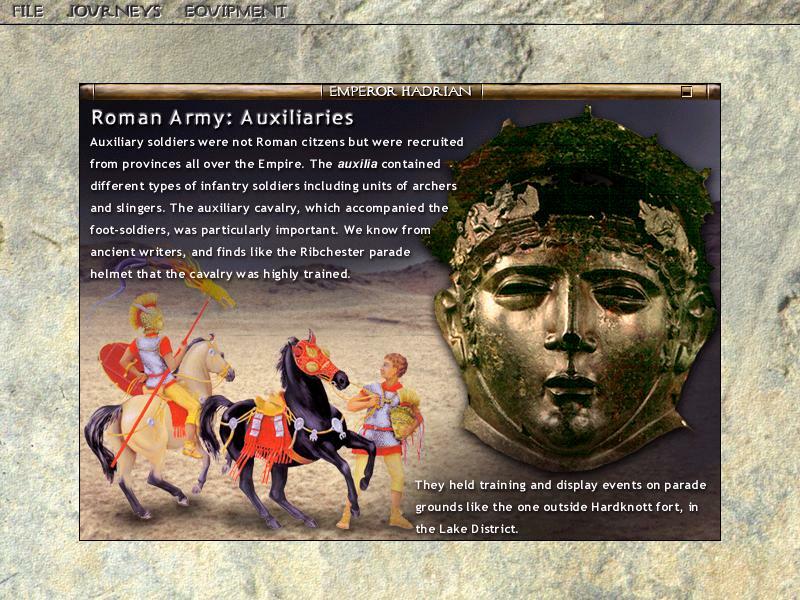 It was whilst putting together a piece of work on 'The Romans in South Gloucestershire' for primary school children that I was asked to review Journeys in the Roman Empire. So often one is left disappointed by the quality or content of a supposedly educational CD-ROM, even when those contributing should provide a high-class product. It is a rare beast that combines exceptional images with a high and enjoyable educational element and academic rigour. Thankfully, this CD-ROM is just such a product. 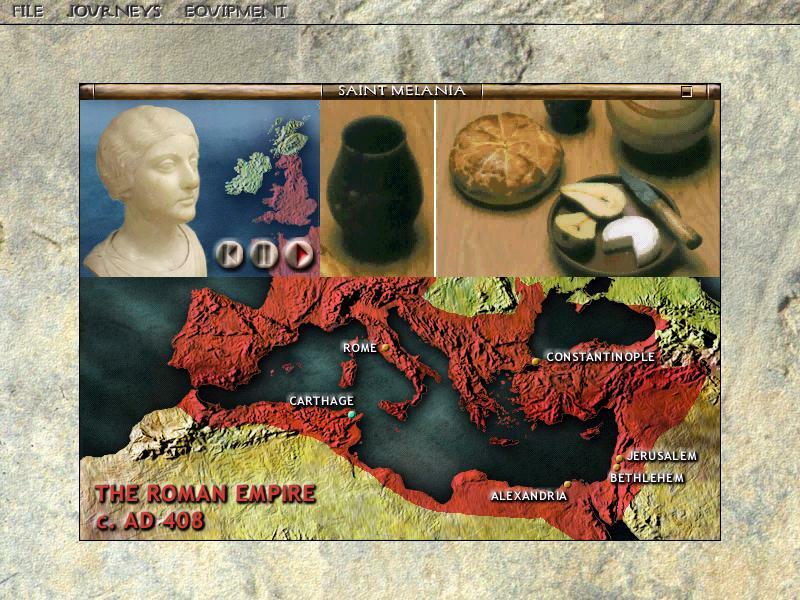 Assembled under the auspices of the British Museum, Verulamium Museum and Channel Four Television, Journeys in the Roman Empire is a CD-ROM that could well prove invaluable to schools studying Rome as part of Key Stage II (8-11 year olds) of the National Curriculum. My delight in finding such a good piece of work was tempered by the knowledge that, in spite of my best efforts, any 'rival' would perhaps seem limited by comparison. The CD-ROM comes in a book-shaped packet with a not particularly exciting cover; digital model of a legionary, blurred map and gold coin. Within this is a printed installation, instruction and help manual - all of which is eminently comprehensible. 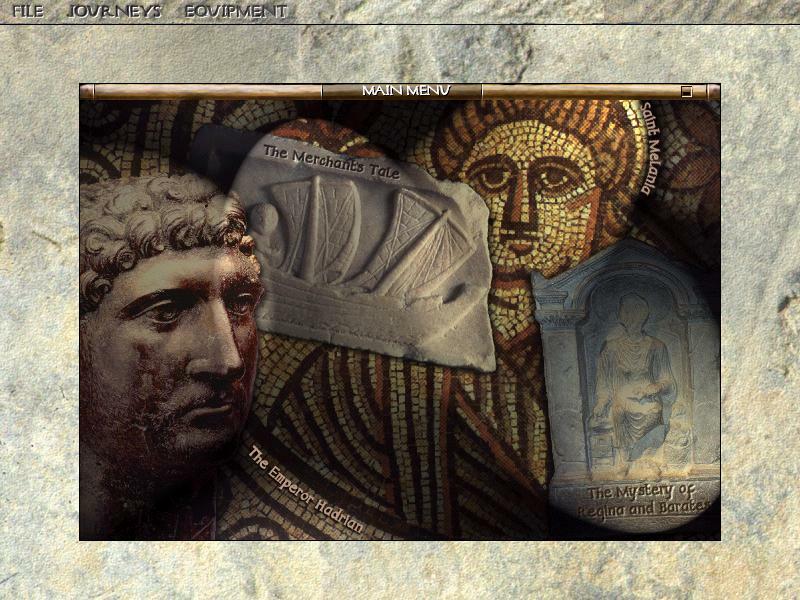 Journeys in the Roman Empire loads onto the hard-disk of the computer but also requires the CD to be in the drive to operate. Although perhaps not a problem within schools, the CD fills the entire screen, hiding the windows taskbar (and thus necessitating Alt Tab to move to other programmes without exiting). The disk tells four different tales, spanning the time period from just before the Roman invasion of Britannia to the demise of the Empire and geographically extends from Britain to North Africa, and introduces children to a myriad of concepts and histories. Not only is each segment educational, it is also great fun and should provoke much discussion in the classroom. A very odd font with flame-orange letters proclaims the start of Journeys in the Roman Empire - a peculiar choice of lettering given that there are so many genuine Roman fonts available. This would prove to be a minor aberration in an otherwise aesthetically excellent product. A help screen introduces our guide for the duration of the CD - a statue called CD Romulus - and provides some introductory text before we choose our first tale. Moving chronologically, something which users of the CD do not have to do, the first journey relates to the days before the Roman invasion of Britain. The 'Merchants Tale' starts in the Roman port city of Ostia - a real treasure-house for those that don't know it; a plethora of fabulous buildings with a pervading smell of wild herbs, and without the sometimes claustrophobia-inducing crowds of Pompeii. The user can pan around a panoramic model of Ostia and move along a couple of set routes to explore the city before meeting up with the Merchant. This speaking statue lends us some money to purchase goods to trade with the locals of Britain. 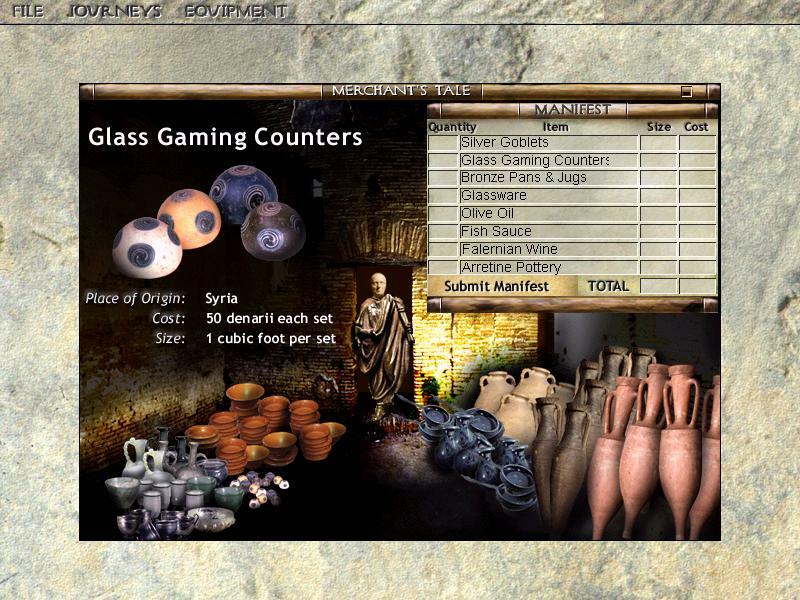 One is shown quite an array of goods and is told about them and the reasons for their popularity with the Britons. Costs then have to be juggled with space available in the ship before setting on the voyage. Rather like the Viking Quest game on BBC's 'Blood of the Vikings' website, the user then makes a series of choices as to the trade routes to take, and has to solve problems arising on the journey. Perhaps these routes took a little long to traverse visually, but this is being hyper-critical. At the end of the quest a tally is made up to establish whether one is a successful entrepreneur and thus perhaps suited to a future career on the commodities markets. This 'game' turned out to be the best of the lot on the CD, in my view. 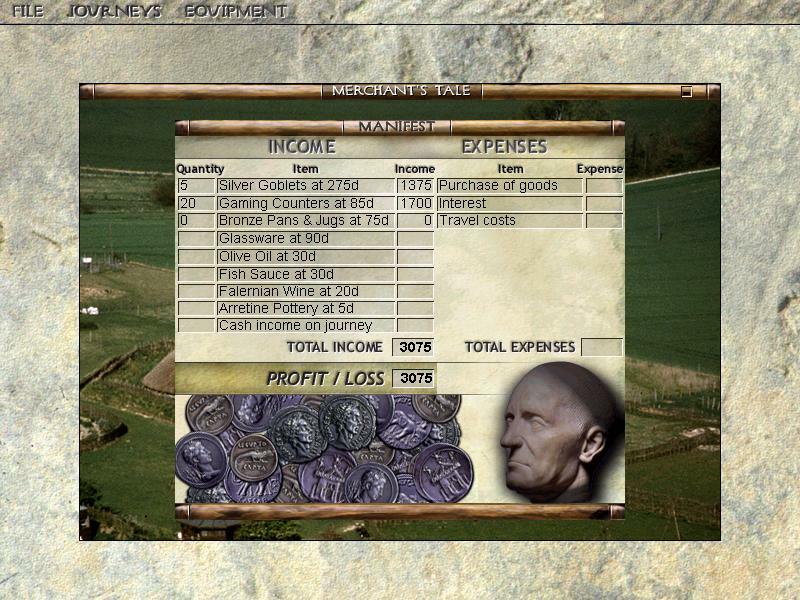 The Merchant's tale certainly fulfils many ICT needs for Key Stage II, with maths, geography, and history all being addressed in an innovative, well thought-out fashion, and succeeds in putting across the importance of trade to the Roman empire. Possibly a class-full of talking statues could become really rather noisy, but the levels of sound can of course be altered as one of the CD options if earphones aren't being used. Sound is without doubt a vital element of the CD, with atmospheric ambient background tunes as well as speech. 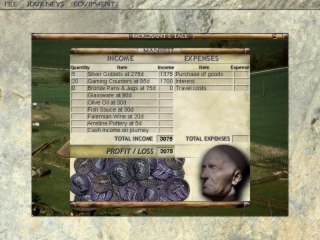 The user can make notes on the various elements by utilising the digital notebook provided in the 'equipment' section of the Programmes taskbar and can place a 'milestone' at chosen points in the CD-ROM to enable an easy return to specific points, a neat touch. The second module is very heavily committed to geographic cognitive elements. The basis of the story is an examination of the policies of Hadrian and his methods of maintaining the boundaries of the empire. 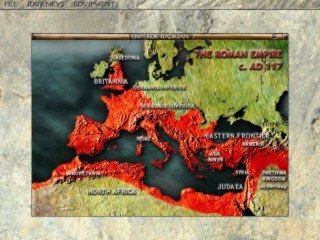 The starting point is a map of the empire in AD 117; this fades to a famous bronze bust of the Emperor and a list of his principles (these can be referred to in the CD's own menubar throughout the module). The user is shown various frontiers of the Hadrianic period and is asked whether to employ diplomacy, wall-construction, or warfare as a modus operandus for their maintenance. If an incorrect option is chosen, you simply make a further choice until correct. At this point one is given more information and moved to the next frontier. As per the rest of the CD, each segment is lavishly illustrated with superb photographs although the forward/backwards hand icons could prove confusing. 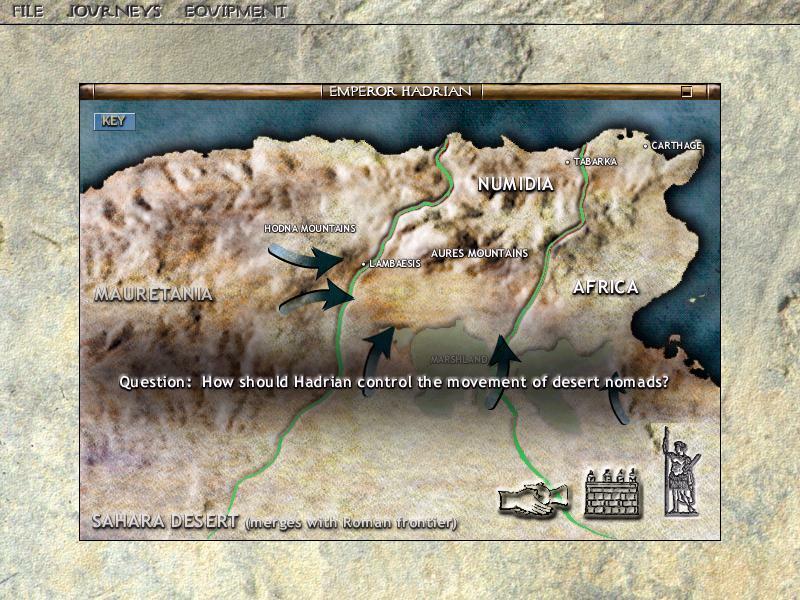 Figure 6: What should Hadrian do with the desert nomads? Having moved around all the frontiers, the CD gives us some pages about the Roman military - the army, navy and auxiliaries - before moving to the game. 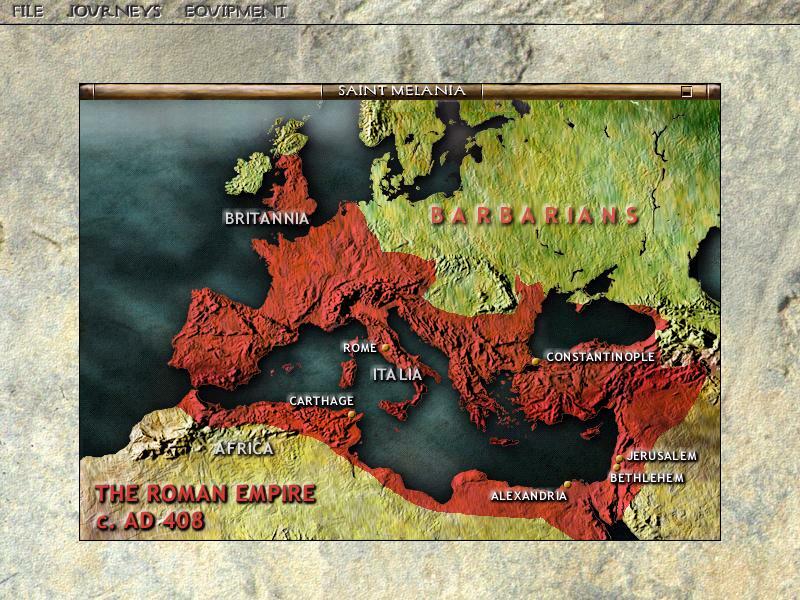 The game for the Hadrianic module reinforces the scale of the empire and also introduces a certain amount of Latin to the students. 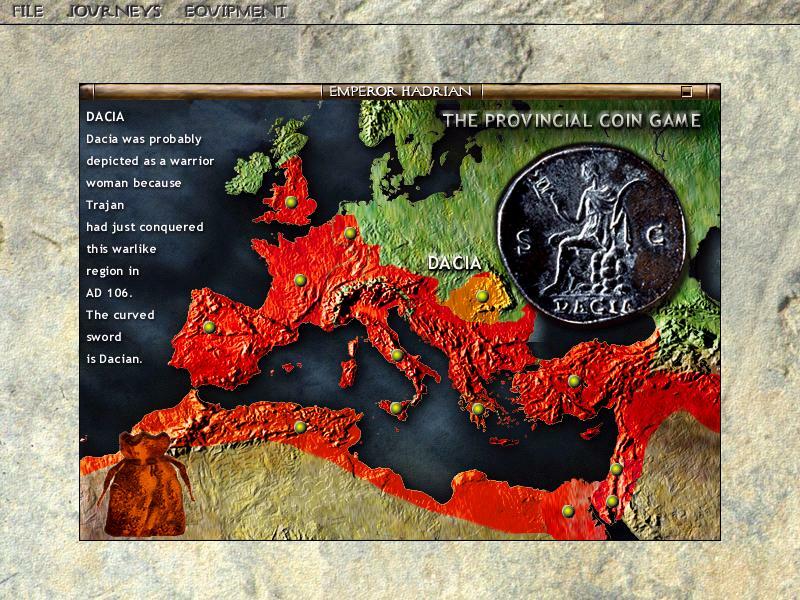 A bag containing coins is located in the lower left corner of the screen and the user has to drag and drop individual coins into the relevant province of the empire to complete the module. The legend on the coin as well as the reliefs on reverse sides enable educated selections to be made. When the coin is placed in its correct segment, further screens of information (with some images that have appeared before) become available to the user. The coins are excellent examples, as one might expect - the producers being able to call on the Department of Coins and Medals at the British Museum for them. 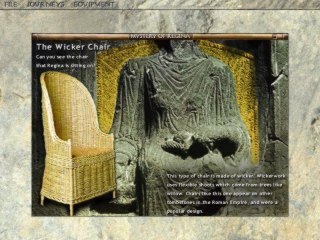 The many images in this section, as with the other three, are all placed in an image gallery where they can be viewed. From the taskbar, one can also play the Roman game, Ludus Latrunculorum (similar to draughts) for added fun. This was my favourite section in that it features a strong storyline and some detective work. 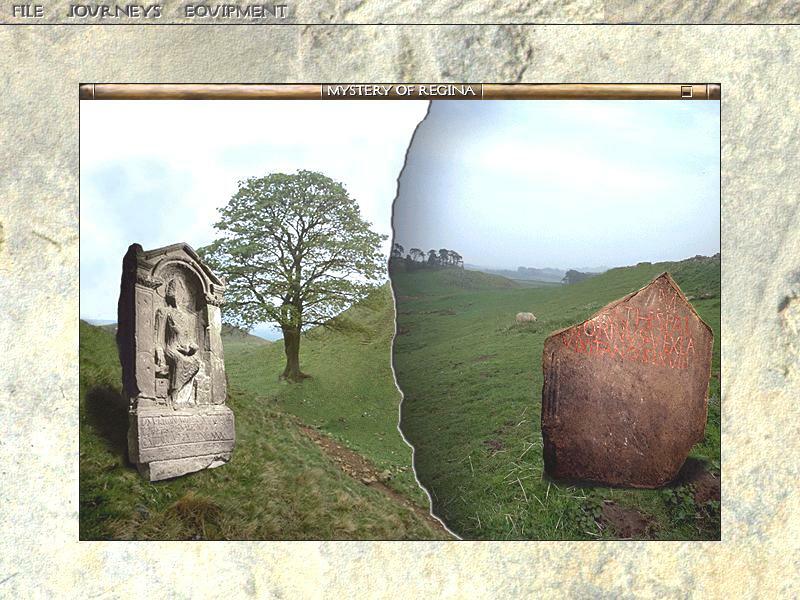 Two famous Roman tombstones from northern England are featured, those of Barates and Regina. 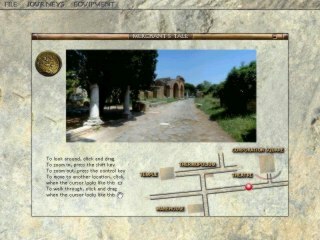 The user is introduced to the section by the guide, CD Romulus, and told to investigate the two tombstones further and find links between them. 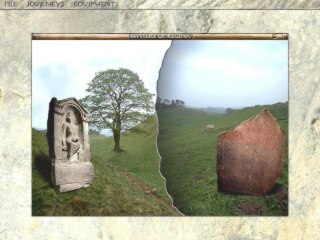 You are shown the tombstones in a rural background (which looks as though it has been chewed by a caterpillar midway across the screen) and with some atmospheric background music. 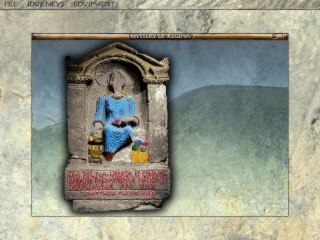 Either tombstone can be selected and more screens can be opened as you delve further into the 'mystery'. The two tombstones demand different approaches. That of Barates has various elements of Latin that can be explored, opening further screens on his life. Regina poses alternative problems. Children are asked to click on each segment of the tombstone which then highlights as an onMouseOver event. When one enters each segment, a detailed photograph of that part of the tombstone is presented alongside a paintbrush icon. You have to colour in the area and, on filling the requisite amount, a further image appears giving some added information about this element. 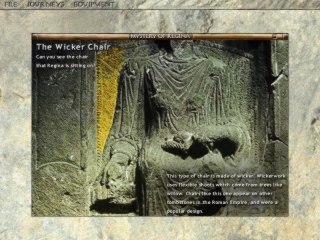 When all of the segments have been moved through, one can then translate the Latin and Aramaic script on the base of the tombstone, providing links between Barates and Regina. Without revealing the links, nor the deciphering of the 'mystery', it is safe to say that strong connections are provided and one can then journey to a moveable (and clickable) map of Palmyra in Syria. 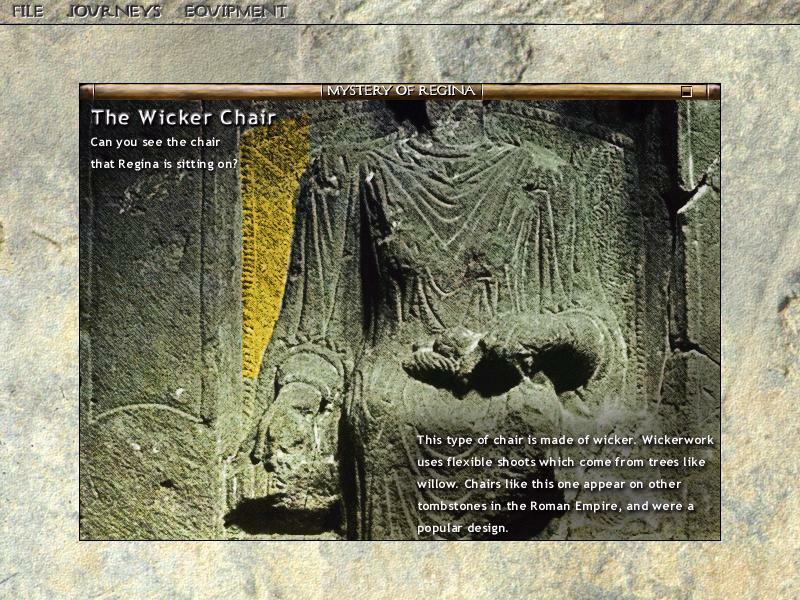 This tale is strong on story content, graphics, atmosphere, and, true to its title, mystery. One of the strengths of the CD is its different approach in all of the modules, maintaining interest. However, this segment proved far too didactic for my liking and, although informative, sure to test the attention span of most nine-year-olds as there is little by way of interaction. One starts with a map of the Roman Empire c. AD 408 and are then spoken to by Melania (again a statue bust) with accompanying 'film' images (or rather still photographs that are panned round automatically). A sound-card is an absolute must here, as the stories of Melania's journeys round the collapsing Roman Empire are related by Melania herself and our guide CD Romulus through speech. The journey lasts for over 10 minutes and, although possibly providing a break for teachers that have to guide schoolchildren through the other parts, it is likely that interest will wane. This is much more suitable for adults and it does introduce important topics relating to religion and the decline of empire. Although clearly towards the chronological end of the empire, and the latest of the four tales, there is a distinct lack of a closing feel to the CD; one feels in need of an 'End-game' (in modern parlance). This being said, the CD is excellent and should provide an invaluable, thought-provoking tool for teachers and children working on the Romans. 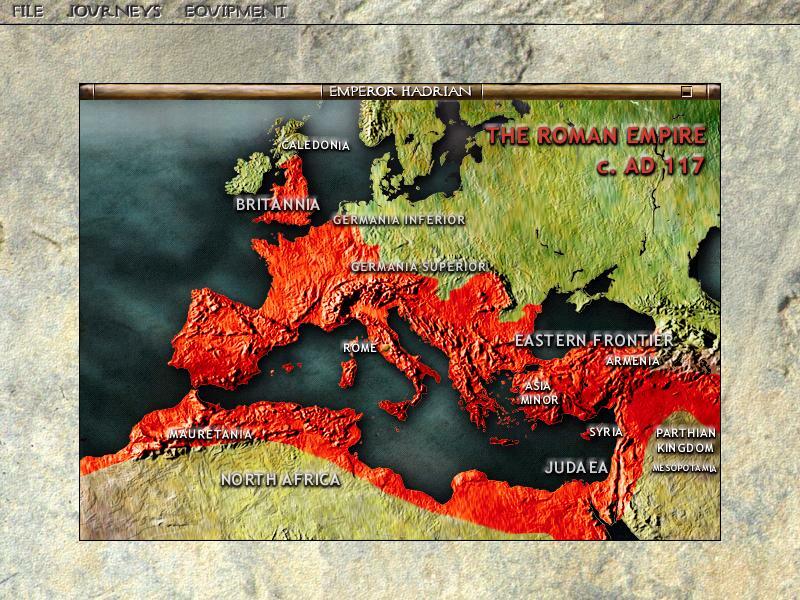 I had recently seen an English Heritage CD-ROM, Real Romans, and Journeys in the Roman Empire is, without doubt, a superior product. The resources of the British and Verulamium Museums have been used to great effect and the level of scholarship involved in researching the stories is blatantly obvious; academics of the calibre of Professor David Mattingly being consulted. Not only is the work academically interesting, perhaps more importantly it is a visual feast with well laid-out pages and exceptional photographs. Journeys in the Roman Empire is certainly to be recommended, and project co-ordinator Sam Moorhead is to be congratulated. Now, what to do with South Gloucestershire...?